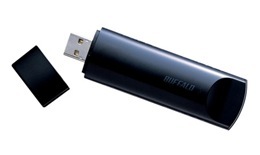 Buffalo's Nfiniti Wireless-N Compact USB 2.0 Adapter offers a sleek and convenient way to add high-speed wireless connectivity through an available USB port on your Windows laptop or desktop. With faster wireless data rates and more coverage than legacy 802.11 products, Buffalo's wireless solutions provide sufficient bandwidth, range, and reliability to stream High-Defnition (HD) video, voice, and music. BUFFALO WLP-UC-AG300, based on Ralink RT2870 series USB Wireless LAN Card.